We all have moments in life when we're down, lonely, or just plain sad. It's part of being human. Just as everyone is different, everyone has a unique way of beating the blues. 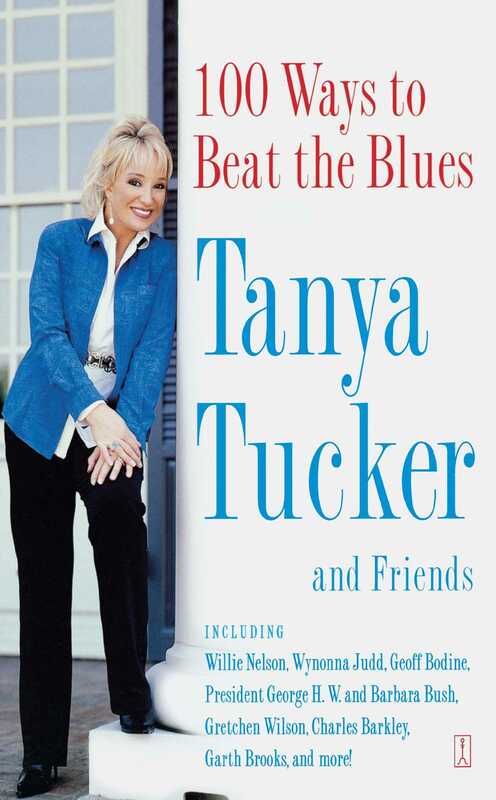 For anyone who needs a bit of inspiration, a smile, or a friendly pat on the back, Tanya Tucker and ninety-nine friends offer this heartwarming collection of their personal recipes for beating the blues. President George H.W. Bush yells at the television. Loretta Lynn makes herself a fried bologna sandwich. Sir Arthur C. Clarke explores the infinite universe of fractals. NASCAR's Geoff Bodine cleans the house. Seventy celebrities such as Kris Kristofferson, Wynonna Judd, and Garth Brooks and thirty ordinary folks such as a farmer, a private detective, a doctor, and a retired gospel radio-show host share what lifts their spirits and remind us of all the joy life has to offer. Any entertainer will tell you that when you get on that tour bus, you sometimes feel you are leaving the problems of the real world behind. You're out there on the road where problems with the plumbing at your house, or the lawn that needs mowing, or the important call you haven't returned are miles away. They'll usually be waiting for you upon your return, but still, it's out of sight, out of mind. But the one thing you can't outrun on the road is the blues. The blues travel fast. They'll catch up. Getting up onstage and feeling the love of your fans goes a long ways toward holding the blues at bay out there on the road. So does getting a call from an old friend, listening to the radio and hearing a great song, or discovering a new artist whose music you love. The sound of rain on the bus's roof always cheers me up. Sometimes, if it's raining when I come in off the road, I linger on the bus a little longer -- not to stay out of the rain, just to hear that pitter-patter sound on the roof. But other times you have to reach down inside yourself and really come up with a powerful solution to the blues. In my case, inspiration comes from my family. My children, of course, always bring me up. A hug, a smile, an "I love you, Mom." And then, I can always look to my parents, to their lives and strengths. Mother and Daddy came up poor and proud, and raised me to believe in myself, no matter how bad things looked. In the late 1930s, my mother's family, the Cunninghams, moved from Abilene, Texas, to work on a ranch near the New Mexico border, in Gains County, Texas. They worked with the horses and cattle, picked cotton, and tended to the watermelon patches. Then the ranch owners struck oil, and, like so many other Texans, Mother's family started working in the oil fields. It was there that Mother met my father, Beau Tucker. In 1943, the two married. Mother was fifteen years old, but from that day on, she was Daddy's support system. She packed up and moved with him as he chased work all over the Southwest. When I was nine years old, we drove up to St. George, Utah, where Daddy had heard of jobs in construction. The jobs were there, but it was an unstable, on-again, off-again industry. At one point we were about as poor as a family could get, living in a beat-up trailer and eating government cheese. Then Daddy lost his job, Mama got sick, and we fell a hundred and fifty dollars behind on our rent. One morning Daddy cranked up his old Ford truck and went out to look for work while I stayed home from school to take care of Mama. All of a sudden, there was a knock on the door. I answered it, and two big men in suits burst into the living room and started yelling at Mama about the rent. She tried to explain that Daddy was on the verge of getting another job, but they weren't in a mood to listen. They were in a mood to kick us out. I yelled and cried, but those men dragged Mama outside, sat her down on the curb, and padlocked the doors to that beat-up trailer. She and I stayed huddled together for two hours before Daddy got home. As it happened, he had found a job, and was able to get a small advance. He rented us a furnished room, and we had a roof over our heads again. But for two hours I had been as lowdown as I have ever been in my life. I will always remember that feeling, knowing that for the want of a hundred and fifty dollars strangers could leave my mother in her housecoat, sick and coughing, by the side of the road and I couldn't do a damn thing about it. I started singing professionally that same year. Four years later, at the age of thirteen, I had my first hit record. My family has never wanted for anything since. So when I get the blues over some real or imagined problem, I picture Mama on the curb in St. George, Utah. And that's when my spirits soar in the knowledge that it will never happen again. So my advice is this: If you've got the blues, look back over your life. Think about other hard times and how you overcame them. Then give yourself a pat on the back. Tanya Tucker was born in Seminole, Texas, and achieved international fame at the age of thirteen when her first single, "Delta Dawn," soared to the top of the charts. Considered to be one of the great song stylists, she has become one of music's most beloved icons. Her recording catalog includes more than a hundred solo and compilation albums; she has been honored with the highest awards country music can offer and has received numerous awards for her work outside music. When she is not on tour she is at her Tennessee farm with her three children: Presley, Grayson, and Layla, as well as assorted dogs, cats, and horses.